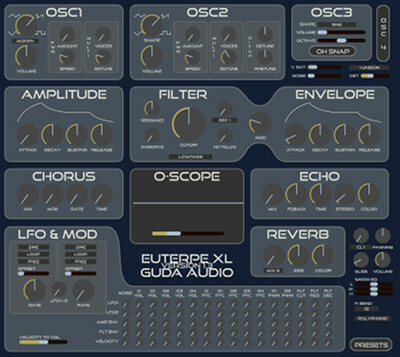 Euterpe XL is a power house synthesizer with 4 oscillators, multi mode filter, builtin effects, LFOs, modulation matrix and a powerful online preset browser. 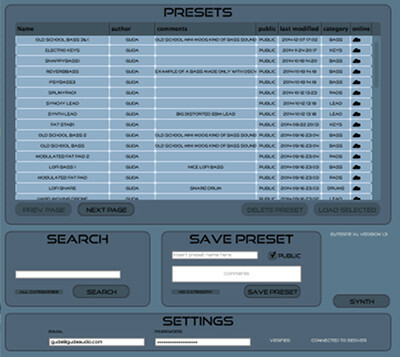 Save and browse presets online and offline. Share presets with other users by saving them public. No separete download for full version, available in 64/32 bit for Mac OSX 10.6+ in VST/AU and Windows 7+ as VST. Osc 1&2 are flexible oscillators with pwm, free morph between shapes and super"saw" for any shape. Osc 3 have the normal shapes and a "oh snap" button to generate wavetables. Draw your own shape with lines and splines and modulate every point with individual LFOs with Osc 4.